I've talked about the importance of covering children's skin when they must be in the sun, but what about clothing for in the water? 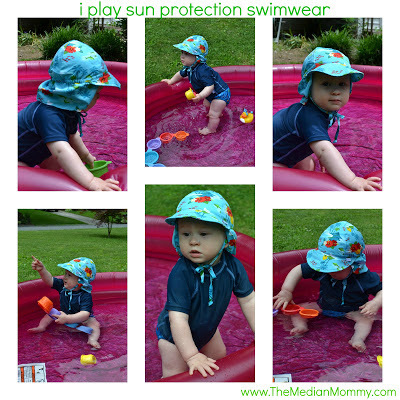 Thankfully, companies like i play make a wide-range of swimwear and clothing options to protect sun-sensitive kiddos' skin, without hindering their water play! Part of i play's philosophy is to create healthy products that "encourage healthy development through play". I was delighted to have the opportunity to test two of i play's swimwear products: the M&M Short Sleeve Rash Guard and the Classics Flap Sun Protection Hat. One of the things I love about i play's UPF 50+ Rash Guard shirt is that it covers a large amount of D's body...which means I don't have to apply sunscreen there! The rash guard is made of a stretchy, lightweight coated material, that moves easily during play and dries quickly after wear. At first I thought that having a shirt in the water would hinder Declan's movement and get in the way of him playing. After trying it out, although the shirt does stretch a little when wet, it stays pretty close to D's skin and doesn't get in the way of play. I'm going to go ahead and admit that I thought that the hats with flaps always looked silly...until I had a baby with translucent skin. i play's Classics Flap Sun Protection Hat is rated for newborn (0-6 months), but I wanted this hat for Declan because it's ties and the coverage it offers. Thankfully, the hat fits D's head at a year old (which makes me wonder how big it would actually be on a newborn), and the flaps offer excellent sun protection (UPF 50+) for his neck and ears, again, without hindering play. The material is extremely lightweight and breathable (it has a mesh lining to promote air flow), so much so that I was shocked that D was able to forget that it was on his head. The ties are excellent because my guy hates wearing hats and always pulls them off. The long brim in the front provides an amazing amount of shading without getting in the way. As you can see in the photos, my blue-eyed little man is actually not squinting in the sun (a rarity in our sunny day photos)! 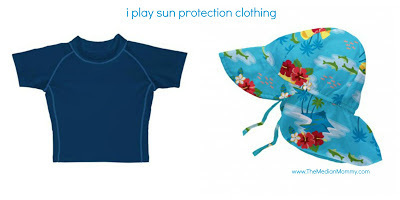 To view a wider selection of gear, visit i play's website at www.iplaybabywear.com. You can also connect with i play via Facebook and Twitter. 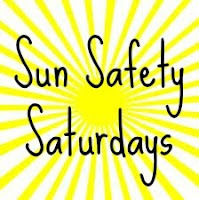 What tips do you have for sun safety? M&M Brim Sun Protection Hat-Pink Flower Field. I'm always looking for more hats because my daughter is very particular on what she will wear. I would also get her a long sleeved rash guard because they are hard to find but very useful. I love the Mama & Baby yoga mat...how adorable! We'd love some of their cute sippy cups! I love the one piece sun suit. I would love this sun protection gear for my baby boy!